The latest Invention by Tamilnadu government to abolish footboard travel. Let us give a big round of applause to welcome this wonderful Invention. are there no steps? or are they retractable?!? I put up another great song by Kurt. tn is not bad at all.. they do good things like this..
the advantages of this invention are two fold! it's also a good way for budding athletes to practice their high jumps! oh my god, now how will they shoot thos love songs on the footboard? 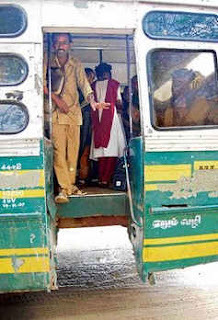 if standing on FOOTboards are banned, they must consider having HEADboards- people cud practice hip-hop on the steps, by balancing the body on their heads..
it's teh best rule in tamil nadu for all the men on the footboard- now they'll all sqeeze right into the bus n get to brush against n crush all the women inside.. the tn govt is promoting promiscuity! LOL....do u notice the words 'Erum Vazhi' on the right?...that should have been 'Thaavum Vazhi' or 'Kudhikkum Vazhi'.